I moved to Devon 10 years ago, originally born in Wiltshire, on the Edge of Dartmoor National Park. This is where I have developed my passion for landscape photography, trying to find time away from my full-time job as a veterinary surgeon. I have developed the travelling bug, which I believe is incurable, so my passion is definitely going global. I think we have probably all returned to the computer, after say a cup of tea, a meal or after popping out and felt disgust at our last 30 minutes of effort at the desk. OK, disgust maybe a bit strong but this got me thinking? Why did I process this image the way I did? That is possibly an unanswerable question but perhaps one with quite a few explanations. Perhaps breaking it down into its component parts from concept to print (or upload) might allow us to analyse why the end result can be so different. It reminds of the ‘raw challenges’ you sometimes see when photographers are given the same raw file to process and they all come back with very different end results. 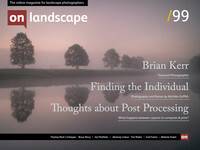 I also thought I would ask some simple questions to some landscape photographers I know and see what their individual answers would be and place them throughout this article. I think there are many common themes that experienced photographers adhere to but also many differences that make each have their own, individual style not just because of their camera work perhaps? What are your goals when you are processing with regards to the end result? Do you enjoy processing and do you think different moods and different time periods after you have captured your image have a bearing on the end result? Do you ever come back to an image and re-edit it or scrap the old one? Visual information processing is the reasoning skill that enables us to process and interpret meaning from our eyes. The way we perceive plays a big role in our everyday life. It helps us in learning a skill like photography and is pretty effortless but perhaps difficult to understand and perhaps a lot more complicated than we realise.